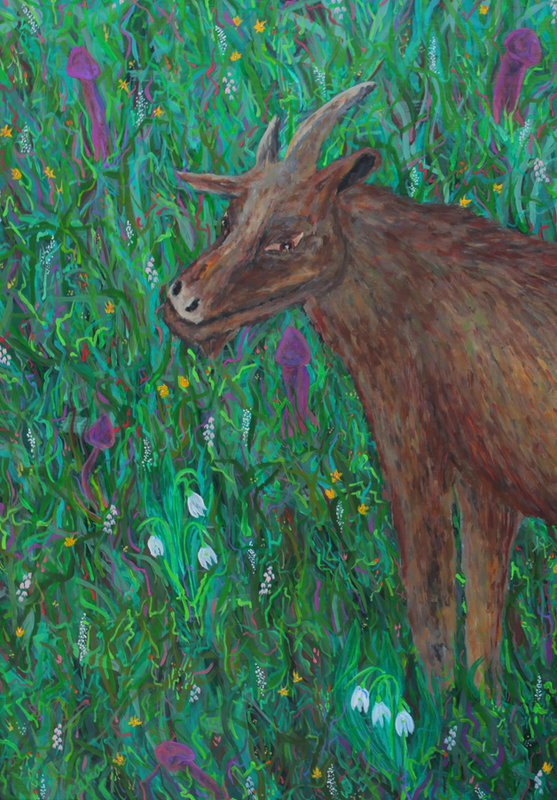 This is a crop of the "In the Steps of the He-goat," which I painted in spring 2009. It's based on one of a series of collages from a a children's book which I remixed and renamed into "Life after death with our country friends" and revolves around animal and sexuality themes. The plan is to turn all the collages into paintings. The idea of this painting is that the male goat has passed through the fields, and in his steps those purple penisoid mushrooms have grown... so our protagonist is looking for him ... The full painting photo is in the painting section, but details from the background are better visible here.